About Sayuri Miura L.Ac., M.S. Graduated with a Master of Science from the American College of Traditional Chinese Medicine in San Francisco. She also holds a Master in Oriental Medicine from the San Francisco College of Acupuncture. Sayuri is licensed by the Medical Board of the State of California, Acupuncture Board of the State of Arizona, and is a Diplomate in the National Commission for Acupuncture and Oriental Medicine. I have a deep connection to the ancient healing arts of Chinese Medicine. From my great grandfather back, my ancestors served as court physicians to the rulers of Japan. At that time Chinese Medicine was the only medicine they practiced. One of my clients told me that every time I gave her a treatment, she saw an old Chinese medicine master standing behind me. He is a strong ally in my healing work. In my clinic, I am committed to give my patients a nurturing and caring session, to focus on finding the background cause of their current problems, and help to resolve them. Often an earlier injury/trauma/problem may be interfering with one's ability to heal. By treating old issues I open up the chances for a body to find its own way into healing. In order to produce the best results, I devote myself to one patient at a time. 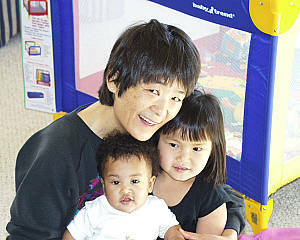 Sayuri with her daughter Emily and one of her smallest patients, AllexosQ Castrell.